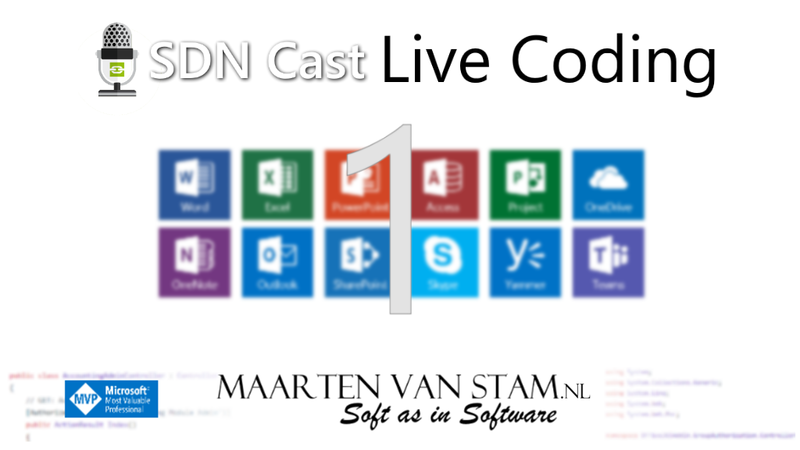 Last two years I have been webcasting every Thursday at 8PM GMT+1/CET on our SDN Cast with my buddies Marcel Meijer, Fanie Reynders and recently added as fourth member Gerald Versluis. In this webcast we on a weekly base discuss the news, events on Software Development and added some demos. Usually the webcast was in Dutch but when we had international guests we shifted to English. Running the webcast is fun, informal and sometimes high level on discussions when talking about Software Development. Last couple of weeks Fanie Reynders and I have been researching to extend our webcasts with actual live coding sessions. Fanie is focusing on his expertise dotNET Core and I am focusing on Office Development. 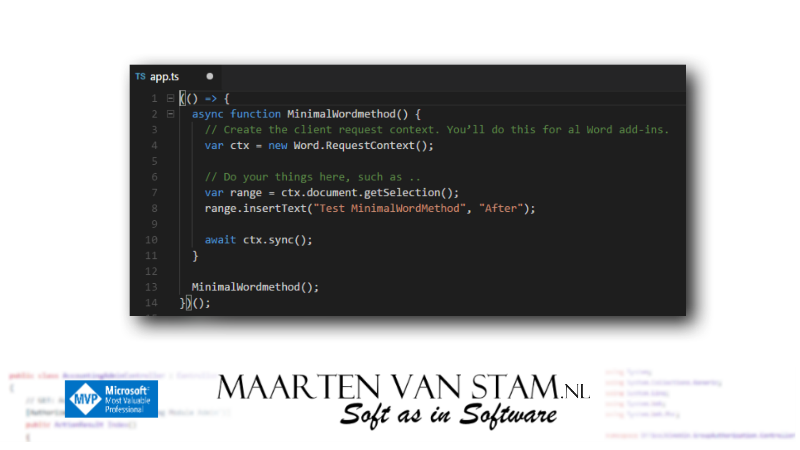 Hopefully we will also bring in Gerald Versluis coding on Xamarin and related stuff. A lot of time went by, and what I liked to do is looking back on my blogposts and see if they still can stand the shift in time all the way to 2019. If you want to follow our Live Coding events (and other SDN Cast webcasts) make sure you subscribe on YouTube or follow me on Twitch! 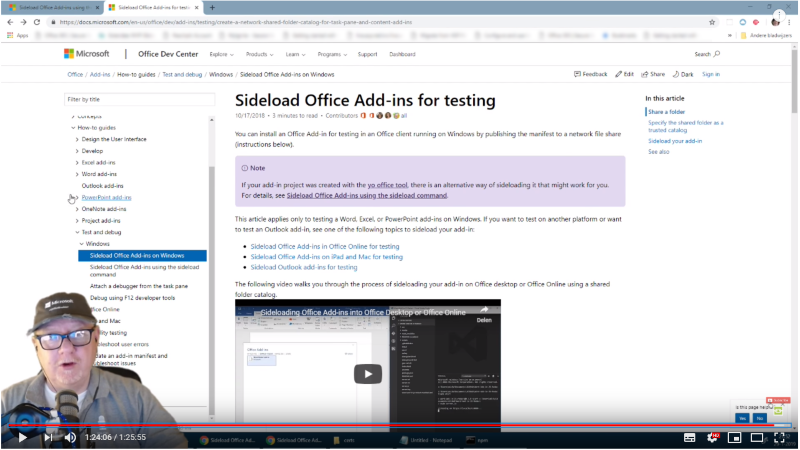 My weekly Live Coding – Office Development webcasts will always be in English (as far as my English goes that is, pretty sure you’ll get the Dutch dialect for free ) so everyone in theory should be able to follow what I am doing. It is still work in progress. Fanie and I are still researching and working on the streaming tools, there is a lot going on producing live webcasts so don’t kill us if we get a crappy chatroom or other bad widgets in the first couple of weeks . Hope to see you in our next Live Coding sesions! 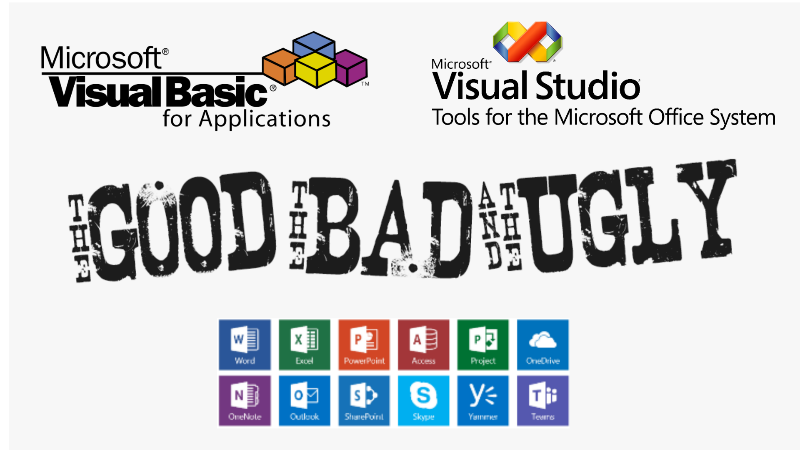 In the short introduction in my previous post “Office Development–The Good, The Bad and The Ugly?” I was showing three of the main options to build Office add-ins (again I will use Office Add-ins with the capital A to indicate talking about the ‘new’ Office JS Add-ins as opposed to add-ins in general). In this post, I’m now going into the first of each of the options a bit: how to start and where to look for things. The first option is Visual Basic for Applications (VBA). If you go back a long time, like I do, this was about your first option to customize your Office environment. None of the other options were around at the time. VBA is hosted within the individual host applications such as Word, Excel, Outlook, PowerPoint, Excel or even some other applications not limited Microsoft to but licensed by Microsoft to these other vendors. Straight out of the box you need to activate the option to be able to use VBA from the host application. In this case Word, you need to go into the File menu option, select Customize Ribbon and tick the option on the right under Main Tabs called “Developer”. 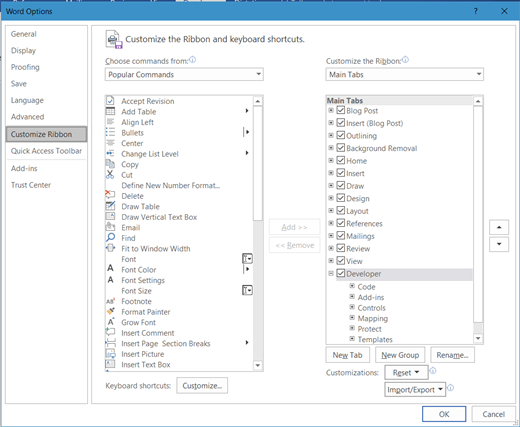 By selecting the tab, you’ll see options like “Visual Basic”, “Macros”, “Record Macro” and more. Ok, now it’s time to enter your first VBA code … we won’t be creating the good old “Hello World” but it sure comes close. Click the “Visual Basic” button to open the VBA Integrated Development Environment (IDE) the environment where you build and (test)run your application. 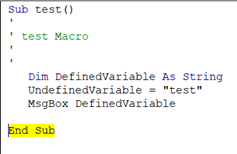 What happened here is that VBA didn’t throw an error as you are perfectly allowed to initialize an undefined variable (the one called UndefinedVariable in the code) but you’ll find that the variable was displayed that you did not initialize, called DefinedVariable. This, especially in larger applications will cause extremely unexpected results and if the variables just look alike it will take you hours to notice that you made a typo somewhere. Where is your code stored? You built your first application, but you wonder … where is it stored. Well that is both the beauty and evil thing about VBA, it travels with the document (template, workbook, presentation … depending on your host application). The beauty because it is very easy to distribute, you just share the document, if it is about Word, to another person in your organization and they can run it. That is also -the risk- of being able to just share it, shady virus writers realized this and used it as a vehicle to spread their viruses in a fairly easy manner. Microsoft tried to solve this issue a little bit by differentiating between file naming. Documents containing VBA code are using extensions with an m like document.docm while ‘plain’ no code documents are named document.docx. It is good to know though, that the old extension .doc still exists. Lack of security and the risk of writing faulty code makes VBA the “Ugly” one of the three options. 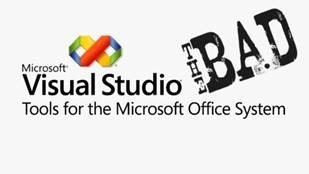 You are perfectly capable of creating the best and most intelligent tools using VBA and there have been some great examples that boosted productivity but it is just not “Enterprise” ready. It is hard to control and can cause a large impact on your support division within your company. So, should you use it? Of course, you can use it whenever you feel it will help you being productive! I still use it myself … if I need to create some quick ‘n dirty solutions to avoid repetition in my “task for the day” it is really easy to record a few lines of code, edit it to fit your needs and run it. I deliberately didn’t go into details of the VBA language. The reason for that is that I just wanted to provide a primer showing the three development options and my goal will be to dive into the “Good” (as considered today) option. If your want to know how to proceed with VBA I suggest you dive into the documentation behind the links below or find some introduction sites. The benefit of a toolset that has been around for such a long time is that there is a boatload of information available on the interwebs to get you started. This post is merely an introduction as part of the big picture called “Office Development” or as I called it “Office Development 2017”. Can’t find what you’re looking for? 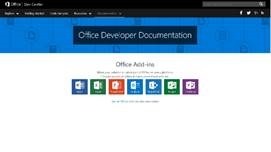 Check out this full list of all development options for Office linking to the URL https://msdn.microsoft.com/en-us/office. 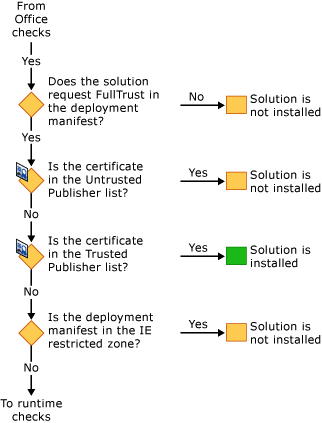 If you follow this URL you’ll notice that it is redirected to, you might have guessed it: https://dev.office.com/docs, the documentation part of dev.office.com. 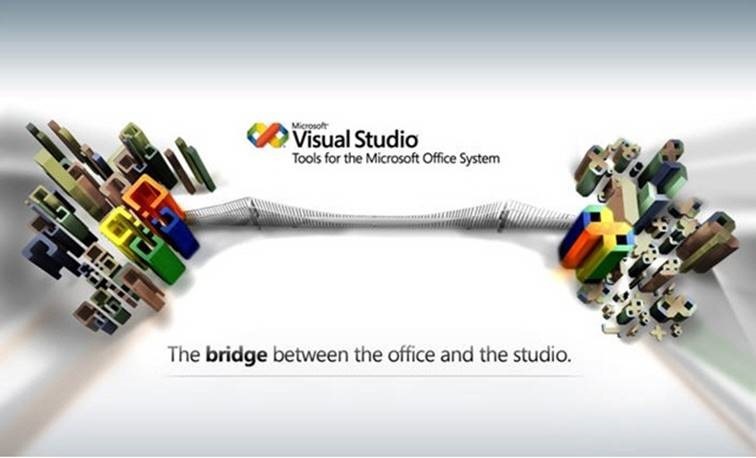 Wait …, what …, why is there a section Office Clients separated from the Office Add-ins? The last item in the list is in fact incorrect, and should have been called “Visual Basic for Applications Reference” or “VBA Reference” or even better “Language Reference VBA” as it redirects to Language reference VBA. It has nothing to do with Visual Basic. 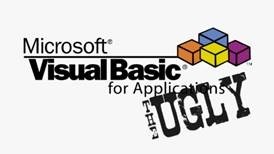 Sure Visual Basic resembles a lot compared to Visual Basic for Applications (I will reference to VBA from now on for Visual Basic for Applications) but it isn’t the same. It’s as if you compare Visual Basic to VB.NET they aren’t the same either. In this case you see a combination of older and newer technologies. 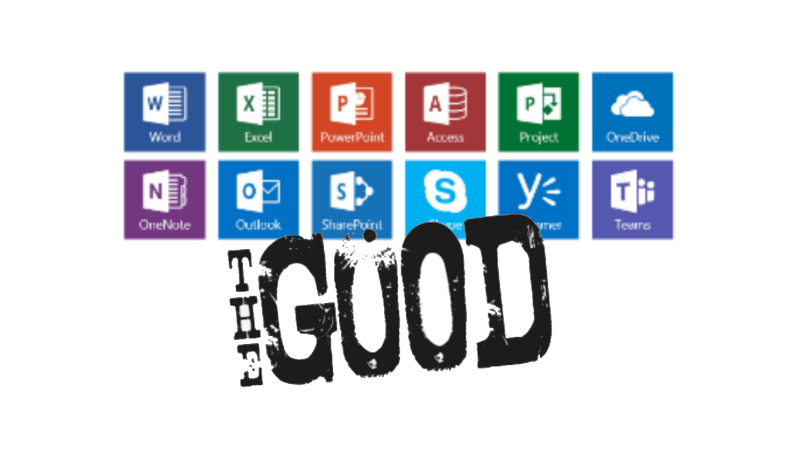 Also under the other subsections you find a mix of newer and older technologies (Exchange) or just newer technologies (Outlook.com, OneDrive, Skype, OneNote and Yammer). 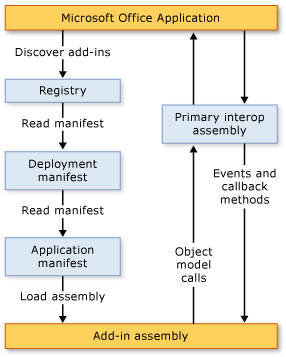 There are even parts missing on this part of the documentation. What about Microsoft Teams as a newer application of Office or existing applications like Microsoft Access. Office and therefor Office Development is just huge, we can spend so much time on these sections, there is no end in all of this. To start the research, I first want to focus on the Office Clients and their Add-ins. 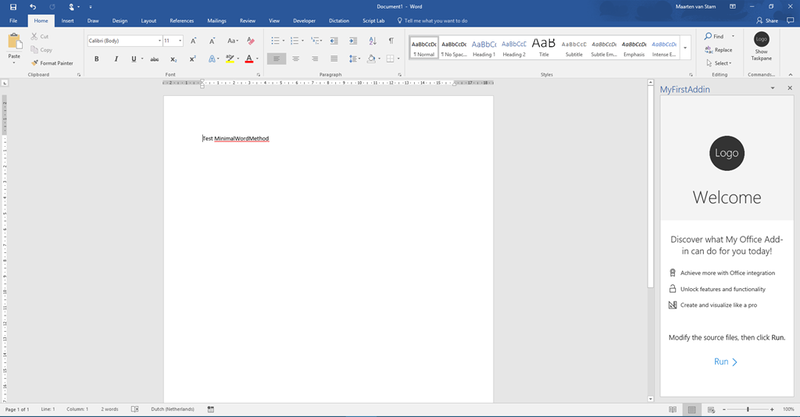 The reason for this is that this was the part that was applied the most when you look at Office customization (adjusting the Office client applications in a way that it suited the needs of the productivity workers). So, I will drill down from the part covered under Office Clients and move over from there to the section Office Add-ins. 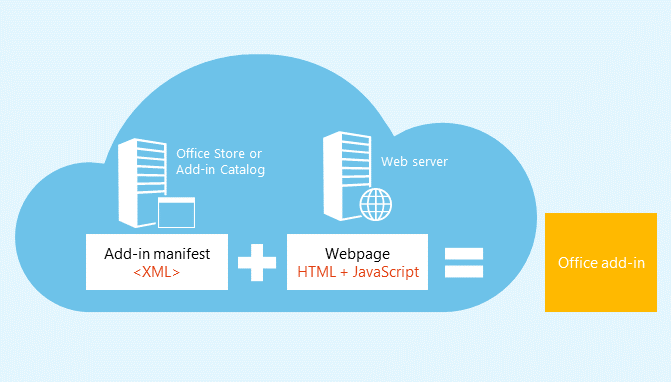 This will provide a sense of history and slowly move into the newer technologies as provided in the OfficeJS APIs.